Apple unveiled larger iPhones and watches based on the design of current models on Wednesday, confirming Wall Street expectations that the company is making only minor changes to its line-up. NEW YORK (BLOOMBERG) - Force yourself to look beyond the superlatives spilled Wednesday about the new iPhones and their turbocharged software brains. There is a single relevant business question for Apple Inc.: What tricks does the company have up its sleeve to keep growing? As Apple concludes its annual circus to introduce the latest iPhone models, it's important to note two facts: The smartphone is the most essential product for the world's most valuable company, and smartphone sales are stuck for both Apple and the industry at large. The company has cleverly managed to deflect and offset those painful facts, but it's not clear yet whether Apple can continue to keep reality at bay. The broad conditions aren't trending in Apple's favor. Globally, the smartphone industry has stalled at about 1.5 billion devices sold each year. That's a large and lucrative pool of potential buyers for Apple, but it is tougher for the company to keep growing if it has trouble selling more iPhones with each passing year. 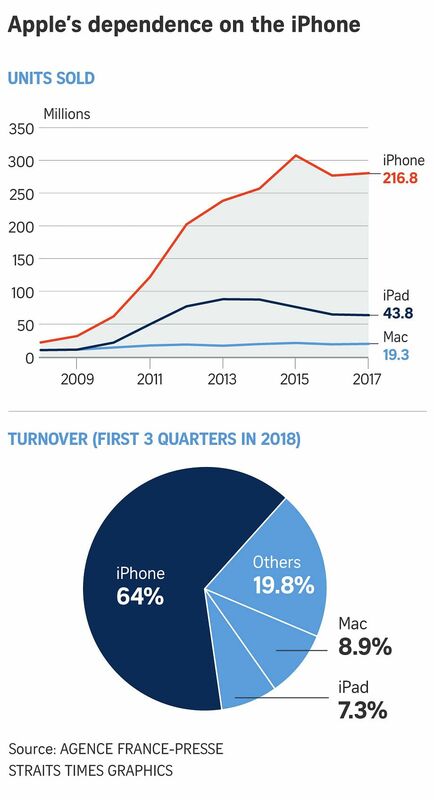 Apple generates two-thirds of its revenue from iPhone sales, and several of its other products are tied to some degree to the volume of newly purchased or existing iPhones. And Apple is having trouble fighting the industry conditions. For three consecutive years, the number of iPhones sold has either declined or crept up modestly. Through the first nine months of Apple's fiscal 2018, it sold 0.4 percent more iPhones than it did at the same point a year earlier. The meek unit sales haven't mattered - yet. In 2016 and 2017, it was easy to believe the iPhone sales figures were anomalies, and Apple persuaded investors to focus on other products whose sales were growing. This year, the largest share of iPhone buyers opted for the iPhone X model with a price of US$1,000 and more. The resulting jump in the average revenue for each iPhone was the biggest contributor to Apple's 15 per cent increase in revenue so far this year. It's a credit to Apple's products and the power of its brand that millions of people were willing to pay a luxury price for a smartphone - a product that has become a price-sensitive commodity in much of the world. The loyalty of Apple fans helped the company grow even as the rest of the smartphone industry struggled to do so. On Wednesday, Apple showed its hand for how it plans to continue increasing revenue even if iPhone unit sales don't budge. The strategy is more of the same: ultra-luxury prices. This pricing strategy seems unfair, but I suspect it will work. The crucial number to watch in coming months is Apple's average price for each iPhone. If it creeps up even higher from current records, that will indicate that more buyers are opting for the larger-screen, larger-price model. Apple most likely can't continue to introduce more expensive iPhones every year. At some point - perhaps as soon as next year - Apple will run up against the cold reality of a no-growth smartphone industry. The company can shift attention to new products, like a rumored Netflix-like service, or Apple can make the hard choice of deciding what kind of company it is now that the smartphone boom has petered out. If Apple wants to continue its history as an innovation and growth engine, it needs a blockbuster new product category. (A Netflix service isn't it.) If Apple is comfortable being a slower growing but wildly profitable company, it needs to sell investors and the public on that. And it needs to sell that vision to itself, too.